Jakarta, Indonesia, 8 September 2016: The organiser of Indonesia’s first major ICT event – Communic Indonesia 2016 – today announced that the inaugural show was a huge hit – with 5,691 trade visitors and 266 exhibitors from 28 countries taking part in the show across four days. Hosted by PT. Pamerindo Indonesia, a member of Allworld Exhibitions, Communic Indonesia was held at The Jakarta International Expo last week and attracted industry professionals from across the globe, providing a showcase of the latest products and state-of-the-art technologies in 5G, Big Data, the Internet of Things (IoT), Cloud and Security. 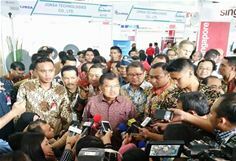 The show was supported by Indonesia’s Ministry of Communications and Information Technology and opened by Indonesia’s Vice President H. Muhammad Jusuf Kalla. This created a huge buzz around the exhibition and the conference, with a number of companies such as Telkomsel and CDN Solutions also making exclusive industry announcements. The show’s exhibitors – including Samsung, AsiaSat and Infinet Wireless – came from 28 different countries including, Hong Kong, India, Indonesia, Malaysia, Canada, Australia, United Kingdom and the United States of America. Several solutions showcased were claimed to be critical to accelerating the development of Indonesia’s ICT ecosystem to fulfil the aim of becoming Southeast Asia’s largest digital economy by 2020. In addition to the exhibition, Communic Indonesia also featured a two-day conference with three main tracks; Broadband and IoT, E-Commerce and Satcom, each including plenary sessions, keynote speakers and panel discussions. Day one alone pulled in 1,926 visitors to the Expo, with the most popular panel sessions and presentations, including ‘Efficient Fiber-to-the-Home (FTTH) Deployment’ hosted by Paul Macaulay, President of the FTTH Council Asia-Pacific and the ‘Power Hub: Provisioning Broadband Networks in Asia’ panel, moderated by Heru Sutadi, Executive Director of the Indonesia ICT Institute. The ICT Summit was co-located with Broadcast Indonesia – an International Digital Multimedia and Entertainment Technology Exhibition & Conference – which provided a platform for top industry leaders to network in one of South-East Asia’s most up and coming markets. Following the success of this year’s show, dates for next year’s show have already been confirmed. Communic Indonesia 2017 will be held at The Jakarta International Expo, in Kemayoran, from October 25-27, 2017 and will again be co-located with Broadcast Indonesia.